Giving an employee feedback on his or her performance is critical for helping that employee grow and feel like they’re making a real contribution. Despite understanding this critical part of employee management, Human Resource professionals sometimes forget that feedback can, and should, go in both directions. Luckily, Employee Channel asked employees for feedback on what they want from HR. Their findings revealed a gap in HR-employee communication. These days, almost all employers struggle to keep their workers motivated. Unfortunately, only 16% of employees feel “connected and engaged” with their employers. Low engagement negatively affects job satisfaction, growth, and turnover rates. It turns out, employees in all industries and work environments value communication from HR – whether HR is an individual, department, or a whole company of Human Resources experts. Employees see effective communication as critical and feel it helps them have a more enjoyable work experience. The importance of communication is clear, so how are HR professionals rising to the challenge? According to the survey, most communications happen either via email or in-person. Unfortunately, email blasts can seem impersonal when used alone, but in-person meetings take valuable time away from the employee’s workday. While phone calls have the potential to bridge this gap, this channel is under-utilized. Despite the importance of communication, most employees agree that HR isn’t doing enough. Nearly all employees feel that their HR team’s communication efforts don’t make them feel more informed or engaged at work. Instead, every employee segment surveyed responded that they wanted better communication from Human Resources. When asked which initiatives they wanted employers to focus on, most said “open communication to all employees.” While many HR teams focus on giving feedback to employees, surveyed employees ranked getting “positive recognition” second on their list of concerns. What does better HR-employee communication entail? Most workers said more frequent communication would be an improvement. 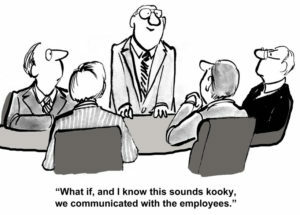 A whopping 75% of employees say that HR never, rarely, or only sometimes communicates with them. When asked how HR could improve communications, the top response was to communicate more frequently. The good news is that in the digital age, communication in business is easier than ever. Marketing, sales, and customer service departments have begun utilizing the latest forms of communication to engage customers more. Personalized customer journeys, customer relationship management tools, and tech support conducted through social media have vastly improved the customer experience. Hunan Resources departments have been slower to utilize these technologies because the benefits for employee-company relationships have been less clear. As more companies adopt these technologies, however, the advantages are revealing themselves. Automated personalized communications reminding employees to renew benefits, tackle growth goals, and take care of their health are quick ways to stay in touch. Time-tracking apps streamline payroll and benefits, while also giving employees instant access to pay stubs and other information. Company groups on Facebook and LinkedIn help employees feel a sense of camaraderie with each other, while private company networks allow workers to share ideas across teams and allow more experienced employees to easily mentor newbies. If your HR team isn’t meeting employee expectations for communication, you may be leaving your workforce feeling more than a little lost. Instead, keep them motivated and let them know they matter to you by making communication more frequent and more personal. Create a culture of more open communication so employees feel like part of the team, not cogs in a machine. Chances are, you’ll see high job satisfaction, lower turnover rates, and a drive to grow with your company. Looking for an HR company that’s up-to-date on the latest communication technology? Look no further. Arch Resources Group offers a variety of systems and tools to help keep your employees feeling connected, engaged, informed, and satisfied. Contact us today to learn which products and services are right for your company! Your Company Is Growing, and It’s Time to Get Serious About HR…Now What?